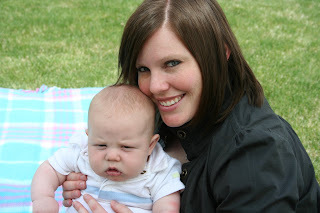 One of the very first blogs I started reading was nominated for the June Spotlight at Mormon Mommy Blogs. If you haven't already been reading Emily's blog, Homespun Light, go check it out! Emily is a Mormon Mom with a few young kids and she writes and hosts book reviews for "clean reads." She recently wrote a great post on how to help young children develop language and vocabulary, and she posts fun and uplifting anecdotes about being a mother. I think she's great. If you agree, hop on over to Mormon Mommy Blogs and vote for Homespun Light in their Spotlight area (right-hand banner, scroll down a bit). Thanks so much, Ryann. That was really nice of you. This is the kind of thing that keeps me going.